Some links used in this post are affiliate links which means I earn a small amount of commission if you purchase an item. Over the past few months, I’ve really been thinking more consciously about my shopping and styling decisions in order to protect both my bank balance and the planet. I’ve been curating my seasonal style inspiration Pinterest boards on a regular basis and have added a Wish List to my blog to keep track of the pieces I want to buy. And it’s been working! I think I could count on one hand the amount of new clothes I’ve bought (excluding charity shop buys) during the first 3 months of 2019 but, despite this, I haven’t been feeling bored or restricted by my wardrobe. However, as the seasons are changing and the weather is warming up, I’m starting to see gaps in my wardrobe and I’m feeling the urge to shop. I’ve been religiously consulting my Pinterest boards and my Wish List before making any new purchases, thinking about if an item of clothing is really something that I want and am happy to spend my money on, as well as if it fits into what I want my style to be. My Pinterest boards say that I’m very into neutrals (as do my ‘Saved’ images on Instagram) and neutral outfits are something that I think look really chic and would like to wear more. However, the pieces I gravitate towards and get really excited by don’t necessarily correspond with this. For example, I recently found my dream dress in the form of the Rixo Monet. It’s baby blue and leopard print with floral daisies printed all over it, I mean, far from my neutral aspirations. I know I’d feel great wearing this dress. I know I’d give up a limb to own it. But it doesn’t fit into my ‘style vision’, so should I still be buying it? Of course, this is totally hypothetical; I don’t have a spare £300 to spend on a dress, or anything for that matter, and if I did, maybe these questions wouldn’t be quite so pressing for me and my wardrobe. But when my budget is limited, I want to make sure the clothes in my wardrobe are all pieces that I love and will get my wear out of. But I’m not sure which methods of purchasing are going to get me to that point. Personal style is something that fascinates me, mostly because I don’t really think I’ve found my own. I know what clothes I like when I see them but do I dress in a way that is consistent? I don’t think so. And could I sum up my style in 3 words? Definitely not, apart from ‘I’m not sure’. I think people who have found their personal style will struggle less with these questions of conscious shopping decisions vs. impulse buys and can probably find pieces that they will love and wear through both methods. But for me, I’m not so sure that it works that way. 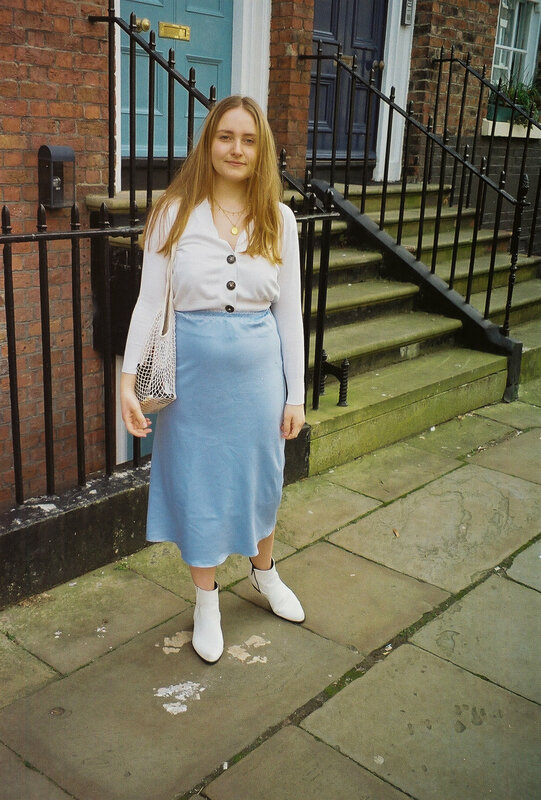 As the title of this post suggests, I am loving baby blue at the moment. Blue is always a colour that I’ve loved wearing; I have blue eyes and people often compliment them when I wear blue clothes so I think it’s become a subconscious liking of mine. So when I saw the satin midi skirt I’m wearing in this post, I knew it had to be mine! 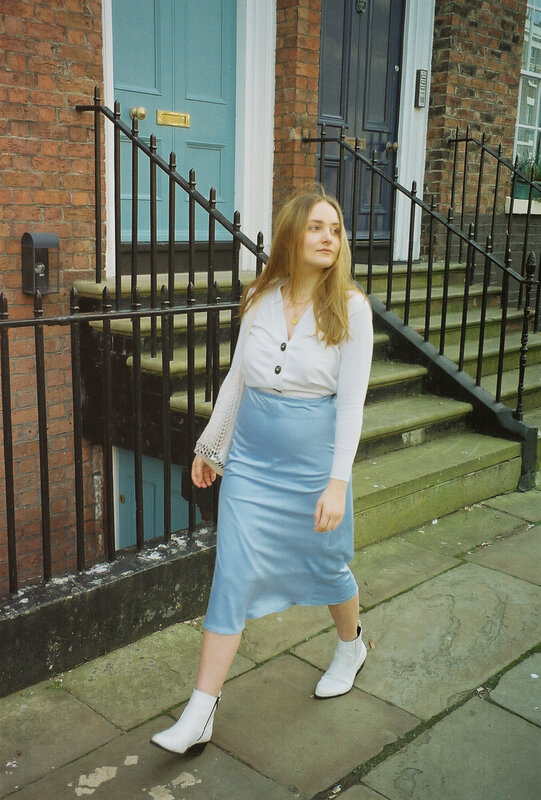 But I didn’t buy it straight away because a baby blue midi skirt wasn’t something that had made its way onto my Pinterest boards, or that I’d ever really felt the desire to own before. But I knew I loved this one, so when I saw that it was on sale for 25% off, I snapped it up. I’ve only worn it once (I mean, that’s pretty good going as it only arrived 4 days ago) and I felt great wearing it but I’ve still found myself thinking a lot about whether it was a responsible purchase. It wasn’t even an impulse purchase as such, but just one that just didn’t fit into my ‘style vision’. Speaking of impulse purchases, I went into Topshop 20 minutes before closing time on Sunday and found a red and white satin mini skirt that I immediately fell for, as it reminded me of a Realisation Par piece that me and my pitiful bank balance have been admiring from afar. I bought it immediately, something I have not done in a while. Usually, I’ll try something on, go home and think about it and then purchase it (or not) a few days later. This was my first proper impulse buy in a while and I felt weirdly guilty about it. My immediate thoughts were ‘well, I can bring it back if I change my mind’. But no part of me wants to take it back. It’s a great piece with so many styling opportunities and it’s not like it broke the bank at £20. So, to come to some sort of a conclusion, I really don’t know whether it’s best to follow your head or your heart when it comes to personal style. A combination of the two sounds about right, but it’s a tricky balance to perfect! There’s no doubt that thinking more consciously about shopping has improved my bank balance and helped me buy less fast fashion, which can only be a good thing. And using Pinterest really has made me more and more excited about getting dressed in the morning! But I also don’t think there’s anything wrong with buying a piece of clothing without having thought it through for hours and hours. Impulse purchases can be good for the soul and there’s no harm in them every once in a while. After all, there’s nothing quite like the excitement of buying something that you love on a whim and I wouldn’t want to lose that! I’d love to hear your thoughts on this subject! Are you more of a planner and conscious thinker when it comes to buying new clothes or are you all about impulse purchases? Let me know in the comments!